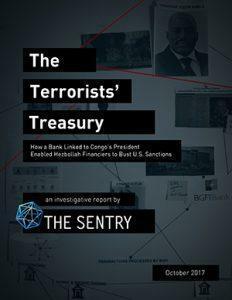 Today, Enough’s investigate initiative, The Sentry, released its latest report, “The Terrorists’ Treasury: How a Bank Linked to Congo’s President Enabled Hezbollah Financiers to Bust U.S. Sanctions.” This is The Sentry’s first report on the Democratic Republic of Congo. The report argues that the same banks used by kleptocratic governments to divert state assets can also be used by terrorist financing networks, and describes how this has taken place at one prominent bank in Congo. Individuals and companies that were under U.S. counter-terrorism sanctions in connection with Hezbollah used the bank to move money through the international banking system. This occurred despite warnings from bank employees and confirmation from the U.S. Treasury Department that doing so could violate U.S. sanctions. This was not just any bank. BGFIBank DRC, the financial institution that processed the transactions, is run by Congolese President Joseph Kabila’s brother, Selemani Francis Mtwale, and has been highlighted in recent scandals in Congo involving the alleged diversion of public funds from state-owned mining companies and the national electoral commission. The U.S. government, European Union, and banks should take strong action in response, applying higher-level network sanctions, criminal investigations, anti-money laundering measures, and enhanced banking due diligence. These measures can help sever the financial lifelines by which corrupt government officials, terrorist financiers, and their business networks operate. TAKE ACTION: US Ambassador to the United Nations, Nikki Haley is set to visit the Democratic Republic of Congo in October. Ask her to show the Kabila regime that financial pressures will escalate until a democratic transition occurs.